"Like" me on Facebook OR read this blog for a nightly recap of Fire in the Triad posts to stay in the loop. You can also follow me on twitter @niksnacks and the hashtag #CompDiningNC for live updates during each battle (dinner begins at 7pm). Please also "like" Competition Dining on Facebook and on the web. The fizz and the bang of the night was brought to us courtesy of the the featured ingredient: Pepsi. Pepsi Bottling Ventures is a 2013 Sponsor of Competition Dining and born in the Carolinas, might I add. Another little tidbit: The name Pepsi (or Pepsi Cola as it once was called) comes from pepsin (ya know, like Pepcid AC), a digestive aid to help quell tummy troubles. I'm happy to report, there were no sign of tummy troubles Monday night! This first course doesn't look very beautiful in this photo, but trust me, it was. This first course does look very tiny in this photo, and trust me, it was. And I ate it before I had the thought to photograph my plate. As the highest scoring dish of the night, the duck fat bacon ate like a piece of country ham. Salty, smoky and thick, it had crispy edges and sat atop an equally smoky and sweet Pepsi BBQ glaze. The glaze tasted of Pepsi up front with a slight, peppery spice in the back. I was wary about the pickled vegetables because in the past, chefs haven't done so well with this menu item. My fears quickly subsided as the root vegetable salad of carrots, parsnips and onions was tart from vinegar but balanced with sweetness from the honey Dijon mustard. Well played, chef. Well played. My favorite dish of the night, this played off my love of Asian food. The dish eaten as a whole tasted like the most upscale General Tso's chicken on the planet. Where General Tso is sweet, slightly spicy, deep-fried and very bad for your arteries, this dish (I suspect) was not. This breast of quail was seared, juicy, plump and full of flavor but I didn't taste or see any grains of pink Himalayan sea salt. The black rice was prepared well, but I didn't detect any truffle either. The absence of those two things mattered not once I stopped fooling around with the minutiae and started eating. The bok choy and onion confit mixed with the fennel chow chow really elevated the dish. The garnish of sliced scallions weren't just for texture of color, they added flavor and another dimension to the dish. The Pepsi glaze was just that: reduced Pepsi, but the subtle nuances of vanilla, cinnamon and nutmeg that are synonymous with cola products was clear and pronounced in the glaze. My least favorite dish of the night, and the lowest scoring, this dish was plated nicely, but that's about it. The duck was prepared well, but tasted and smelled a little gamey. Covered with a Wild Cherry Pepsi glaze, it masked some of the gaminess, but when mixed with the Asian pear batons and the strips of fresh, sweet snow peas, it needed something to cut the saccharine. I hoped the chive polenta would do the trick, but it just exacerbated the issue. The polenta was sweet, too. And grainy. Very grainy. It was like having a mouthful of cooked sand. In an extended celebration of Food Allergy Awareness Week, I received a modified plate without the pistachio arugula pesto. I silently cursed the food gods as the aroma of the pesto made me want to steal someone's plate and then poke myself with an Epi-pen. No pistachio arugula pesto. Only broken dreams. Very few foods make me want to risk death. This may have been one of them. A table favorite, and highest scoring dish of the night, I wanted to know what everyone was raving about and I for the first time, I feel as if I missed out. 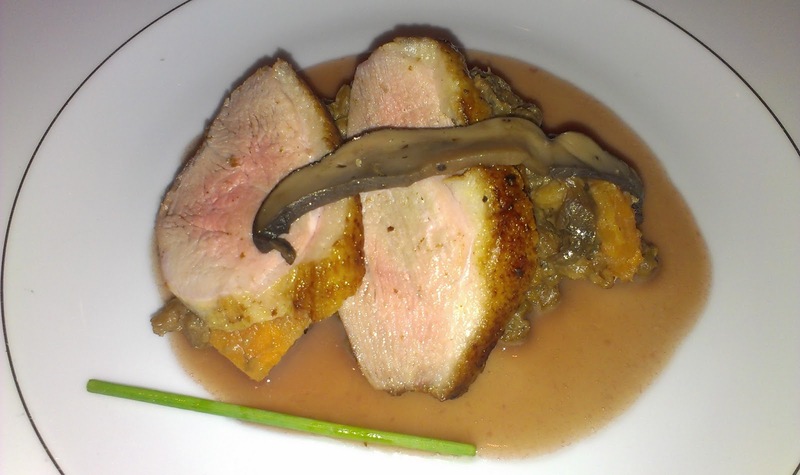 I will say, that the duck breast medallions matched perfectly with the texture of the wild mushrooms. The farro risotto was interestingly sweet with chunks of sweet potato hidden throughout. I wasn't a fan of the Pepsi beurre rouge, but other diners commented that it helped cut the sweetness of the rest of the dish, when paired alongside the (verboten) pesto. Crowned with an unlisted salted and crushed cashew garnish, this was the highest scoring dessert course of the night. This morsel of soft cake was delightful, pressed against the meyer lemon sorbet, which I suspect was really just a meyer lemon creme anglaise because it was melted. 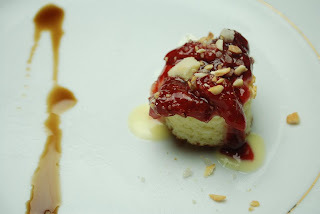 The strawberry and Pepsi jam layered over the cake was thick, sweet and delicious. Other diners commented that they could have done without the cashews because their saltiness took away from the flavors of the rest of the dish. The vanilla Pepsi reduction seemed a mile away from the cake and I had to consciously drag my bit of cake through it to pick up the flavor. Matched perfectly with the cake, I wish it had been incorporated in a different way as to not seem to be unconnected to the rest of the dish. Not the prettiest dish of the evening, one of my dining companions said,"Well, this isn't fair. This chef is going to win. There's bacon." And he was right: where there's bacon, there's a win. It didn't matter that the profiterole looked like a rock from the moon, it was filled with sweet, warm cream and I normally don't like cream-filled things [no jokes, please] and that was the best part. It didn't matter you could hear the 1000 clunks of spoons hitting plates and crunching through the crumbly, dry bottom of the mini pie throughout the dining room. A win was in the works. The strawberry-Pepsi-white chocolate-mousse combination was sprinkled with cinnamon and you know how they say bacon is meat candy? Well, let me tell you about this bacon: This was definitely meat candy. The crystallized sugar coated bits of bacon swimming in a Pepsi glaze were perfect on their own, with the insides of the profiterole, the pie, the mousse, with my spoon and with my mouth. As you know, every vote of every diner counts. 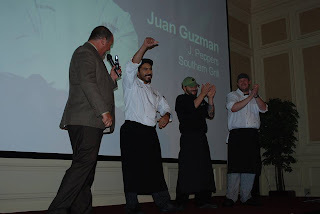 With a mere 1/10th of a point difference, Chef Juan Guzman of J. Pepper's in Kernersville bested Chef Fuller of Crafted. I can't say that one chef rose above the other because each course was matched note for note, spice for spice. 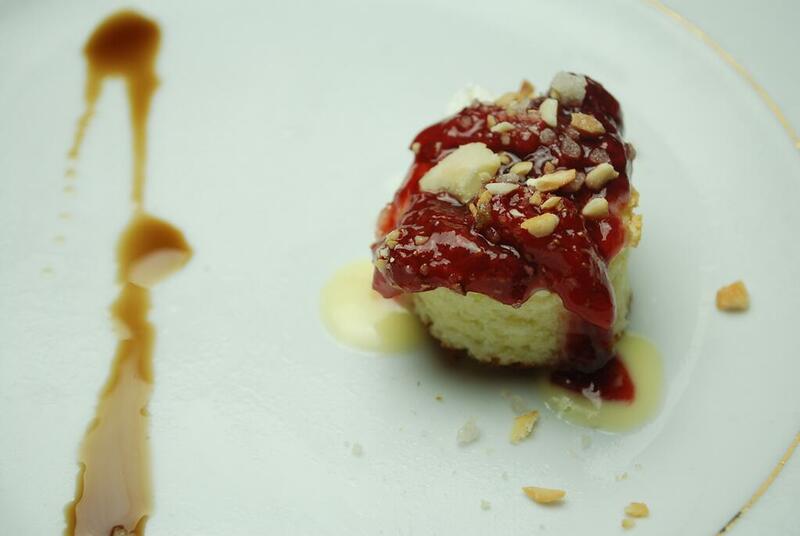 But a note to other local chefs: Dessert and bacon are a diner's Achilles' heel. It gets us every time. 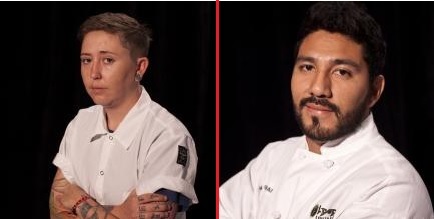 Congratulations to Chef Guzman. Thank you for your food and your 1,000,000 watt smile. See you on June 4 against Winston-Salem's Noble's Grille.